Tim Federle, February 2013. 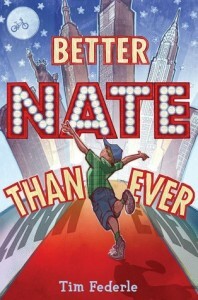 Thirteen-year-old Nate lives in Jankburg, Pennsylvania, with a family he can’t relate to. He’s bullied in school for being pudgy and effeminate; his only solace is best friend Libby, who understands his Broadway dreams and helps him improve his singing and acting. When Nate’s parents go out of town for the weekend, he seizes the chance to take the bus to Manhattan and audition for the part of Elliott in E.T. : The Musical. Country-mouse-in-the-city adventures ensue as Nate learns about panhandlers and tipping, buys clothes for two dollars, finds the biggest Applebee’s in the world, meets kids with crazy stage moms, and more – all while his family figures out he’s gone and begins a massive manhunt. Luckily Libby’s on hand to cover for him back home. I love a book that happens all in one day, and this one didn’t disappoint. 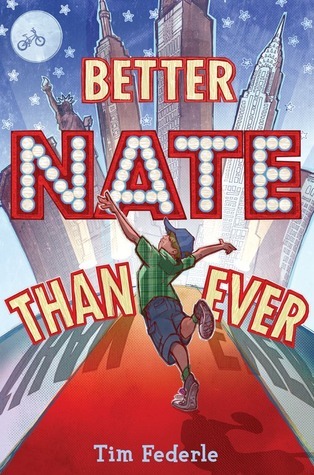 Nate’s bumbling, gee-whiz attitude combined with his good cheer and lack of ego mean his narration brings the reader along with him on his journeys. It makes sense that he wouldn’t be cast as Elliott, and the role he does land is perfect for him. His family is just messed up enough that you feel sorry for him without having to feel horrible for him. And the gay part is great. Nate tells us early on, “My sexuality, by the way, is off-topic and unrelated. I am a freshman at the College of Sexuality and I have undecided my major, and frankly don’t want to declare anything other than ‘Hey, jerks, I’m thirteen, leave me alone. Macaroni and cheese is still my favorite food – how would I know who I want to hook up with? '” Because of this, the book is romance-free, appropriate for all ages. Yet later Nate is intrigued and delighted when he sees two boys kissing in a club, and can’t believe no one’s harassing them. It’s this, more than anything, that convinces him New York is where he belongs. This entry was posted in 2013, fat, gay male, gaytopia, passing mentions, queer adult, queer protagonist, realistic, secondary queer character, Tim Federle. Bookmark the permalink.